In celebrating the 1st anniversary of the opening of the Patek Philippe Salon at the flagship store of Tiffany & Co. in New York, the two companies have launched a co-branded wristwatch, the Ladies' Gondolo. Double-signed with Patek Philippe and Tiffany & Co., the Ladies' Gondolo will be sold exclusively at the Tiffany Patek Philippe Salon in New York. 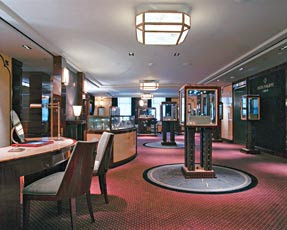 Joining the salons in Geneva, London, Paris and Shanghai, the 3,000-square-foot salon is the first Patek Philippe in the United States (which opens in April, 2008), and the fifth in worldwide. Located on the mezzanine floor of the Tiffany's Fifth Avenue store, the New York salon showcases the current collections as well as timepieces on loan from the Patek Philippe Museum in Geneva. In fact, the Ladies' Gondolo isn't the first timepiece collection that Tiffany has teamed up with Patek. The first collaboration between the founders of the two companies, Antoine Norbert de Patek and Charles Lewis Tiffany, was started in 1851.